This is book 2 of Victoria Aveyard's Red Queen series. (Please go here for my writeup of Red Queen, which includes a brief summary of the universe of the book.) Please note from here on out that there are spoilers for the first book. 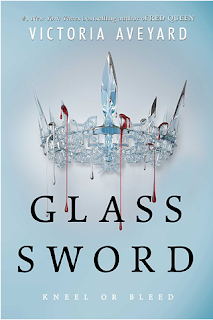 Summary: Glass Sword picks up pretty much right where the first book ends, with Mare and Cal fleeing the capital city of Archeon after all hell breaks lose - Prince Maven and Queen Elara have been manipulating them the whole time, angling for control of the throne. Queen Elara, using her mind control powers, has made Cal behead his own father, and it is revealed that she was responsible for Cal's mother's death as well. With Cal and Mare on the run, Maven has ascended to the throne, promising to find them and kill them. Mare's only hope lies in the list of Newbloods - other Reds, like her, who also have special abilities. Along with the help of the Scarlet Guard, they must find the Newbloods before Maven does and then try to assemble them into an army of their own, in order to stand some sort of chance against Maven's forces. But this mission doesn't come without its own difficulties, sacrifices, and losses, and as Mare pushes her motley team forward into danger, it starts to become apparent that the biggest sacrifice she might have to make will be herself. Thoughts: As with many Book 2s, this sequel serves to kick things up a notch, with our protagonist committing to the cause and raising the stakes. As I said in my other review, while I would call this a fantasy book because of the kings, queens, magical powers, etc., this series actually has a LOT in common with dystopian series like The Hunger Games, Divergent, etc., because of the theme of revolution and war, and also because of the role our heroine plays in the turn of events, generally ending up as the unwitting leader, the symbol of the revolution. Unlike Katniss or Tris though, Mare is a whole lot less likable in this book 2. That's not a criticism of the writing, but a compliment - meaning, I think that was intentional. Even with their flaws, it's a lot easier to get behind Katniss or Tris than Mare, and that's because she is, in my opinion, more messed-up than they are. But then again, she was less admirable than they were to begin with: in their respective first books, Katniss goes out into the arena to take her sister's place, and then she works hard to save Peeta, and Tris is an Abnegation (by definition: selfless person) exploring her own personal limits as she takes on Dauntless' initiation process. Mare started out, by her admission, as a thief and a sneak, with no admirable skills or redeeming qualities. She is thrown into a bad situation by sheer circumstance, and while she learns quickly and survives it, she ends up creating a lot of chaos, like a person trying to walk away from a dinner table with the tablecloth stuck in their pants. The difference between Mare and the other two girls widens in their second books. Katniss, wanting nothing more than to live a quiet life and forget her experiences in the arena, is thrown back in against her will, and moreover, she essentially gets conscripted into the revolution without her consent. Tris too is experiencing PTSD from the events of the first novel, and the life she was responsible for taking haunts her even as she too joins her revolution. Mare too is suffering the effects of Maven's betrayal from book 1, but she appears to double-down in this book, as she constantly makes decisions that are dangerous and sacrificing of others. If she has any heart left, she keeps it closely guarded, which makes sense, since trusting others ended up being her fatal flaw in the first book. While it's understandable that, in times of war, there are difficult decisions to be made and losses that simply have to be accepted, Mare herself at times starts to wonder if she is becoming what she hates, as she risks the lives of the people around her, sometimes without giving them a choice. This is what I liked about this second book. For someone who is supposed to be a hero, Mare can really be a jerk sometimes (and not in the badass, amusingly-cocky way that Celaena Sardothien can pull off). Mare can be inconstant, secretive, cold, and cruel. Sometimes she says things that are hurtful to the people she loves. Sometimes she brushes off people's cries for mercy. Sometimes she is petty. Sometimes she loses sight of what her goal is, aside from "Destroy Maven and Elara." Sometimes she thinks about Maven too much and she misses him, and sometimes she ignores her better judgment and kisses Cal. Book 2 is a hot mess of death and fighting, and the stakes have definitely been upped. The other thing I really liked about this book was finding the other Newbloods - it was a bit like watching X-Men or something, with all their amazing abilities. This book kept me riveted, and just when I thought things for our heroes had gotten bad, there was always worse waiting around the corner. If this book were a movie, it would be a blockbuster action movie for sure, with a healthy dose of psychology and character study thrown in for good measure. 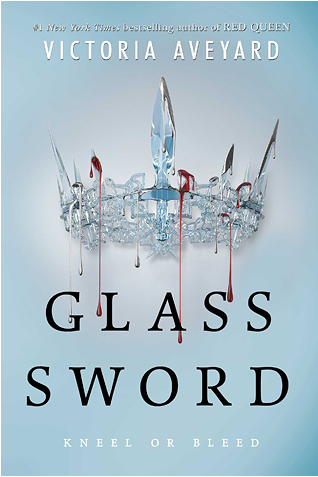 Glass Sword does what all good second books should do - to get the reader amped and ready for the finale. And BOY, am I ready. It's just too bad that I have to wait an entire year for the last book to come out. *edited to add* Apparently there will be FOUR books in this series, according to Goodreads. Oh boy.